My Books - Wild With Gabriel! "Oh No, Gertrude!" is a full-color picture book for children of all ages that tells the true story of Gertrude, a Black Bear who got into trouble because of naughty people. I wrote this book when I was 10 years old to help raise awareness about what people can do to help keep bears safe. It is carried in National Parks around the USA and has sold more than 8,000 copies so far! I was honored to work with wildlife photographer Rodney Cammauf whose stunning photographs accompany the story about Gertrude. I never set out to be an author, but when I met Gertrude in 2009 and discovered that she was put in trouble because of naughty people, I knew I had to do something to protect her and all of the bears that I love so very much. That same year I met Rodney Cammauf, a park ranger and professional photographer, and when I saw the amazing photos he had of Gertrude I knew we could work together to make a difference in the life of bears! Gabriel proudly poses in the National Park Bookstore where his book is sold. 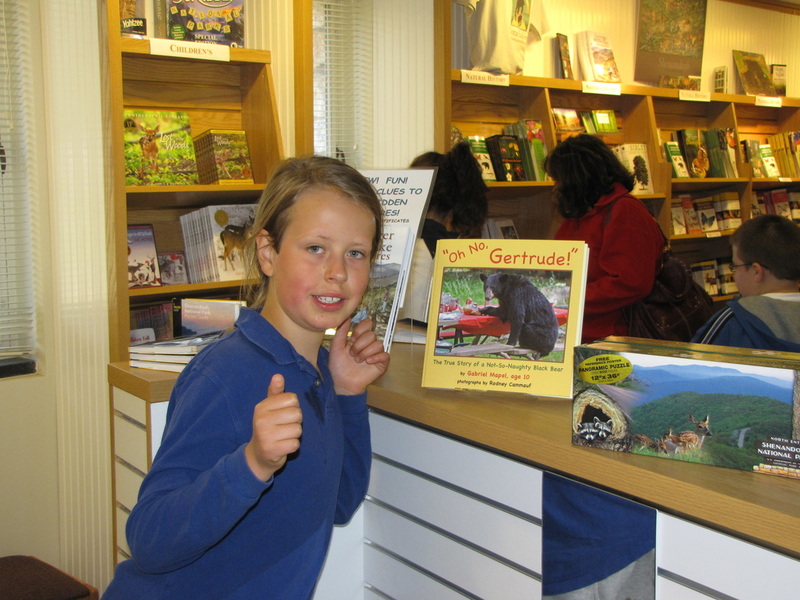 After a book reading in Shenandoah National Park Gabriel took time to sign copies of "Oh No, Gertrude! ", inspiring other children to write their stories too! Stories and Photographs of Adventures with my Bear Friends. My Life With Black Bears is a collection of stories and photographs about some of my favorite encounters with Black Bears. Each year I spend hundreds of hours among bears, studying their behavior and following bear families through the generations. My Life with Black Bears is my way of sharing my passion for Black Bears and my commitment to their protection. I invite you to read and learn about these amazing creatures! ​"Gabriel Mapel is a talented young naturalist with an astonishing connection to wildlife. Through years of careful observation, he has gained an unparalleled first-hand knowledge of the lives of Black Bears as individuals. In this remarkable and awe-inspiring book, Gabriel gives us a unique chance to look inside the world of these magnificent animals." ​"Gabriel is a young man blessed with an innate understanding and love of bears - he has been given the gift of observation and the patience it takes to really "see" what is before him. We are all lucky that he also takes the time to record and share his experiences and thoughts with us. The bears have a much needed ally and advocate in Gabriel." "Gabriel has a very special connection with bears, and it is astonishing that such a young person has had such profound experiences with, and has such a deep understanding of, these amazing creatures. This book is an opportunity to learn from Gabriel about the life of Black Bears, and it inspires and encourages us to do our part to make sure that these amazing animals are understood and protected." Gabriel now volunteers as an interpretive ranger for the National Park Service. He watched a bear with Ben and his family and presenting them with a copy of "Gertrude" when they were through. Ranger Gabriel helps a young park visitor with his Junior Ranger Booklet.